Bone repair after fracture is a highly regulated process that occurs in several stages; an initial inflammatory phase, development of a soft callus, replacement of the cartilaginous callus with a bony callous, and bone remodeling. Dysregulation of these steps compromises healing and bone regeneration. The angiogenic factor VEGF is critical for bone repair and remodeling; however, the cell sources of and the cells types that respond to VEGF are not well defined. Kai Hu and Bjorn Olsen at Harvard School of Dental Medicine studied fracture repair in a mouse model and determined that osteoblast-derived VEGF is critical for several stages of the bone healing process. Specifically, evaluation of mice harboring an osteoblast-specific deletion of the VEGFA-encoding gene revealed that osteoblast-derived VEGF promotes macrophage recruitment during the inflammatory phase, couples angiogeneisis and osteogenesis, promotes cartilage resporption in the periosteal callus, and stimulates osteoclast formation during the remodeling phase. The coupling of angiogeneisis and osteogenesis required appropriate levels of VEGF, as 0.1 μg of VEGF improved bone repair in mice lacking VEGFA production in osteoblasts but 1 μg of VEGF did not benefit the healing process, despite enhanced recruitment of osteoclasts. VEGF likely acts as a paracrine factor in healing bone, as conditional loss of VEGFR in osteoblasts resulted in increased mineralization at the repair site. Together, the results of this study reveal that osteoblast-generated VEGF is critical for multiple stages of bone repair and suggest therapeutic strategies that precisely control VEGF have potential to improve bone repair and regeneration. The accompanying image shows sagittal sections (left) of injured tibiae and 3D reconstructions (right) of the periosteal callus in a control animal (top) and a mouse with osteoblast-specific deletion of Vegfa (bottom) at postsurgery day 28. Note the reduction in callus thickness and volume in the VEGF-deficient mouse. Citation Information: J Clin Invest. 2016;126(2):509-526. https://doi.org/10.1172/JCI82585. Osteoblast-derived VEGF is important for bone development and postnatal bone homeostasis. Previous studies have demonstrated that VEGF affects bone repair and regeneration; however, the cellular mechanisms by which it works are not fully understood. In this study, we investigated the functions of osteoblast-derived VEGF in healing of a bone defect. The results indicate that osteoblast-derived VEGF plays critical roles at several stages in the repair process. Using transgenic mice with osteoblast-specific deletion of Vegfa, we demonstrated that VEGF promoted macrophage recruitment and angiogenic responses in the inflammation phase, and optimal levels of VEGF were required for coupling of angiogenesis and osteogenesis in areas where repair occurs by intramembranous ossification. VEGF likely functions as a paracrine factor in this process because deletion of Vegfr2 in osteoblastic lineage cells enhanced osteoblastic maturation and mineralization. Furthermore, osteoblast- and hypertrophic chondrocyte–derived VEGF stimulated recruitment of blood vessels and osteoclasts and promoted cartilage resorption at the repair site during the periosteal endochondral ossification stage. Finally, osteoblast-derived VEGF stimulated osteoclast formation in the final remodeling phase of the repair process. 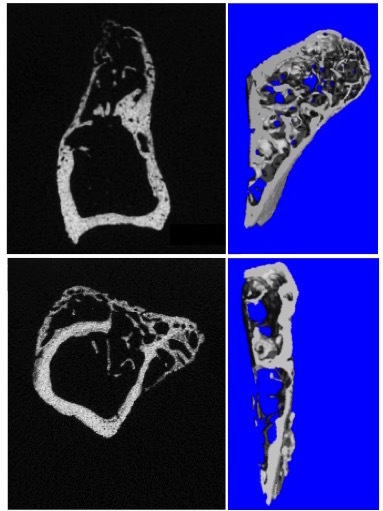 These findings provide a basis for clinical strategies to improve bone regeneration and treat defects in bone healing.